When the chassis is in maintenance position, move it to the fully installed position by performing the following procedure. 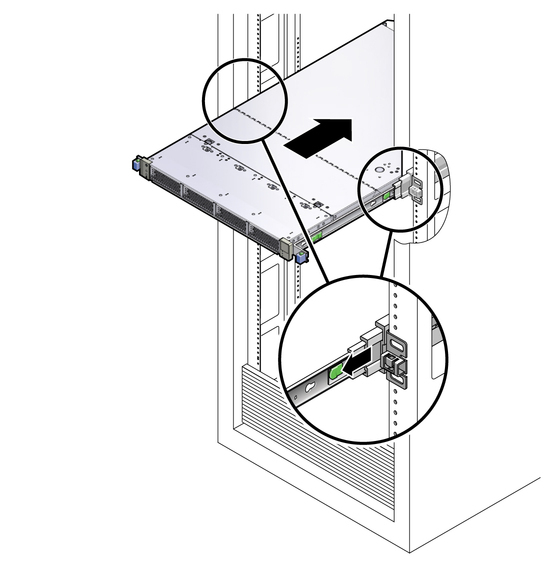 Release the slide rails from the maintenance position by pushing the release tabs on the side of each rail as shown in Returning the System to the Fully Installed Position. While pushing on the release tabs, slowly push the system into the rack. Ensure that the cables do not get in the way. Reconnect the cables to the back of the system.